A lot of technical system interacting with a human operator or user directly but every technical system incorporates a person at some of its terminations. .
click here) The EPS concentrates psychological pieces of knowledge which are used and adapted to use to the field of engineering in general. Its roots extend to the army psychology of II.WW. And the youngest branches of the EPS are still developing disciplines connected with artificial intelligence, virtual reality or cyberspace. 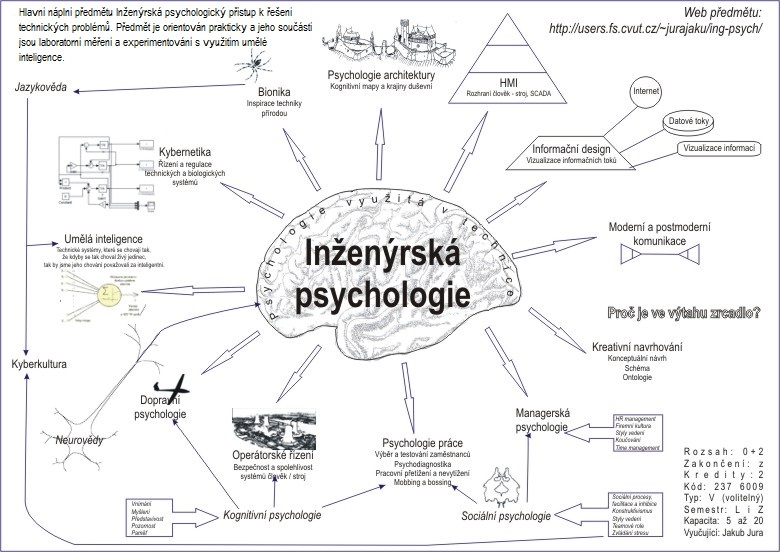 The main aim of engineering psychology is to help designer plans well-operated system. Also is possible to tell, that aim of EPS is to fit a technical system to its user and vice versa to fit the user to the technical system (by it is menas e.g. traning :) ). The prime theoretical background for EPS is mainly general psychology (and especialy cognitive one). And this is the reason why the subject is divided into two parts � General psychology and its application � Engineering psychology. Next theoretical sources for the EPS is e.g. Cognitive science - interdisciplinary consortium contains psychology, Computer Science included AI, Neuroscience, Linguistics, Philosophy or Social Anthropology. Internetová podpora předmětu Inženýrská psychologie vyučovaným na FS ČVUT.